This is Italian comfort food at its finest. I remember growing up having this many times during the month. Money was tight and this fed many. We still love it. 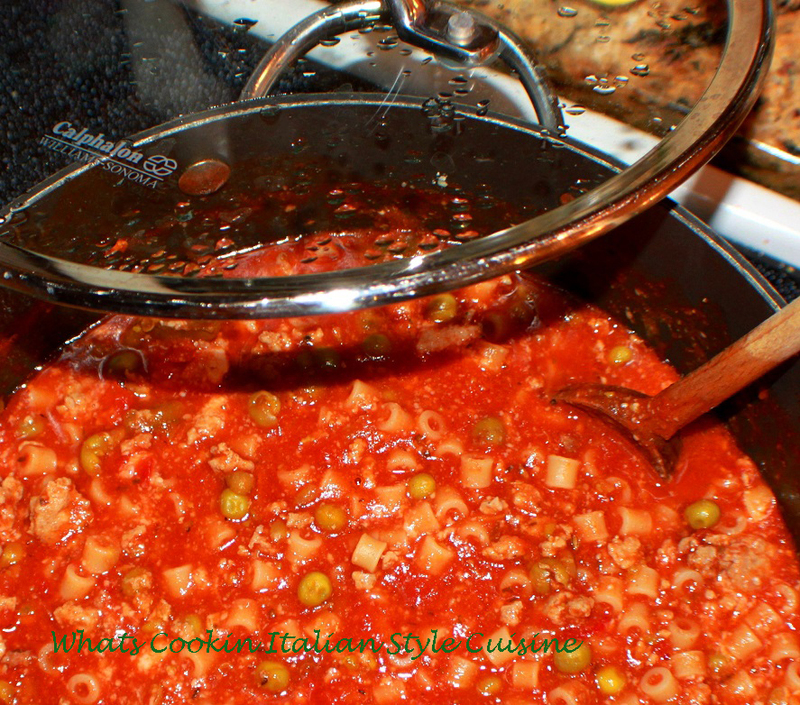 Sop this up that Italian bread and you have a fabulous meal in one pot! Really old fashioned Italian style food right here. Comfort food, especially in the cooler months. 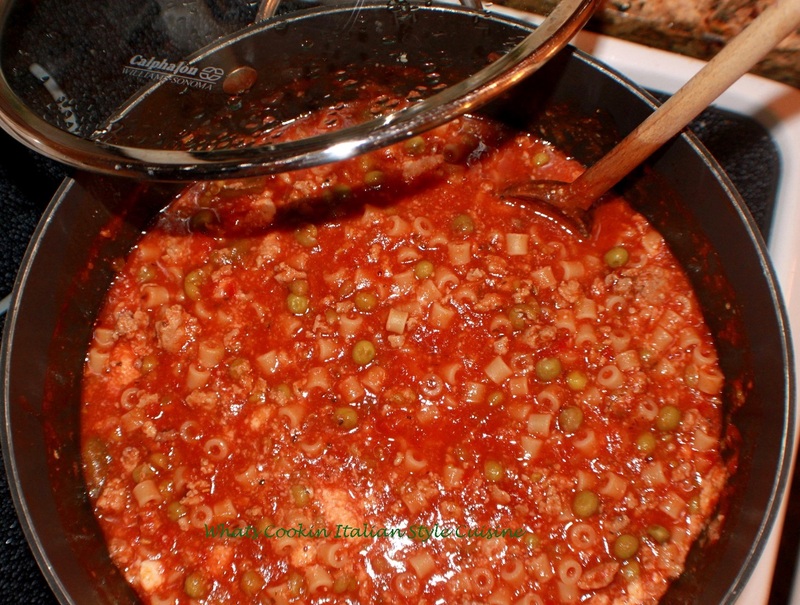 My grandmother would make this with the leftover Sunday tomato sauce during the weekdays. If there was beef left then she would use that meat, sometimes even sausage or meatballs. Whatever was leftover in the Sunday sauce was many time added to this dish, meat wise. I called it Italian goulash, I guess that's what it reminded me of. My mom did make the American Italian version of goulash with crusted meatballs, sauce and elbow macaroni. The only thing missing were peppers. As I got older I realized it was nothing like goulash, I really love this dish. It has so much old world taste. I didn't realize until I was grown up that they considered this depression food, as it was inexpensive to make and actually re purposed from Sunday sauce leftovers. As the years go on with just those cherished memories, there was alot taught. I learned how to stretch a budget when things were tight with money and still eat like a king. These meals become more and more asked for because they were great. This recipe fed alot of family members for just a little money and now in this next generation, my kids love it. The best recipes coming out of the 1960 era that were frugal in cost are the best memories and delicious meals to date, I wouldn't change a thing. I miss the love that went into it, but those memories live on in the kitchen. In a large saucepan saute pork, fennel and adding 3 tablespoons olive oil saute till pink is gone. Add peppers, garlic, peas, salt, pepper, oregano, basil, red pepper to taste. Saute around 4 minutes, add wine and tomatoes. Simmer on low around 25 minutes adding 1/2 cup grated cheese and water to keep it a medium thickness if too thick add more water. Boil pasta separately. Add ditalini that's been cooked to package instructions al dente' to the sauce. Serve in a bowl with grated cheese on top.